For today’s roundup, we’ve brought you deals on a wide range of gadgets. 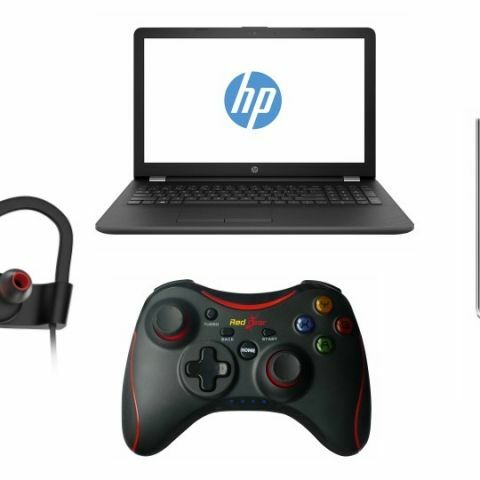 The list consists of products from brands like HP, Sony, Logitech, Philips and more. We’ve put together a bunch of gadgets in the list that are available on Amazon with a considerable discount for the day. The list contains earphones, laptops, gaming controllers and more. The HP 15q-BU004TU Laptop sports a 15.6-inch display. The laptop is backed by a 2GHz Intel Core i3-6006U 6th Gen processor with 4GB DDR4 RAM and 1TB hard drive. The device is installed with DOS, which means one needs to install their preferred OS separately. Click here to buy. The Logitech F710 Wireless Gamepad features 2.45GHZ wireless connectivity. It has a dual vibration feedback motors and a 4-switch D-pad. The device is also compatible with Android TV. Click here to buy. The Logitech Prodigy G403 is a wired gaming mouse that weighs around 10g. It comes with six programmable buttons and offers onboard memory that allows users to customize the commands as per their preferences. Click here to buy. The Sony MDR-EX150AP headphones feature an in-line microphone and remote that lets you manage calls and audio tracks easily. The box includes three sets of ear tips and a wire-manager that won’t let your wire tangle. The headphone is available in five colors blue, red, black, pink and grey. Click here to buy. The Philips SHL5000/00 On-Ear Headphone features a swivel ear cup design that enables easy storage. The headphone comes with a noise isolation, which means it can reduce outside noise for a better listening experience. It has a 32mm neodymium drivers and has an impedance of 24 ohms. Click here to buy. The HP 16GB USB flash drive features USB 3.0 connectivity, which can transfer the files faster than the USB 2.0 interface. The pen drive is compatible with both Windows and Mac. Click here to buy. The TAGG Inferno 2.0 Sports is a wireless and water-resistant in-ear headphone, which features an IPX7 rating. The headphone is equipped with Bluetooth 4.1 connectivity and sports a 120mAh battery, which as per the company can provide eight hours of music playback. Click here to buy. The Redgear Pro Wireless Gamepad features two analog sticks and two analog triggers. The controller can work up to a distance of 10 meters from a connected device. As per the company, the battery can last up to ten hours on a single charge. Click here to buy.